Ford Motor Company’s revival of its “heritage” models was fully realised when the company released a modern equivalent of their historic Ford GT40, a four-time winner of the 24 Hours of Le Mans. The newly christened Ford GT mimicked the look of the original with modern power plant and undercarriage. With just a few more than 4000 GT’s built, the car has become a modern icon in its own right. An optional factory paint offered in 2006 delivered the same colour and racing stripes used in the races at Le Mans. The light blue and orange racing treatment was symbolic of the Gulf Oil Company’s sponsorship of the winning cars. 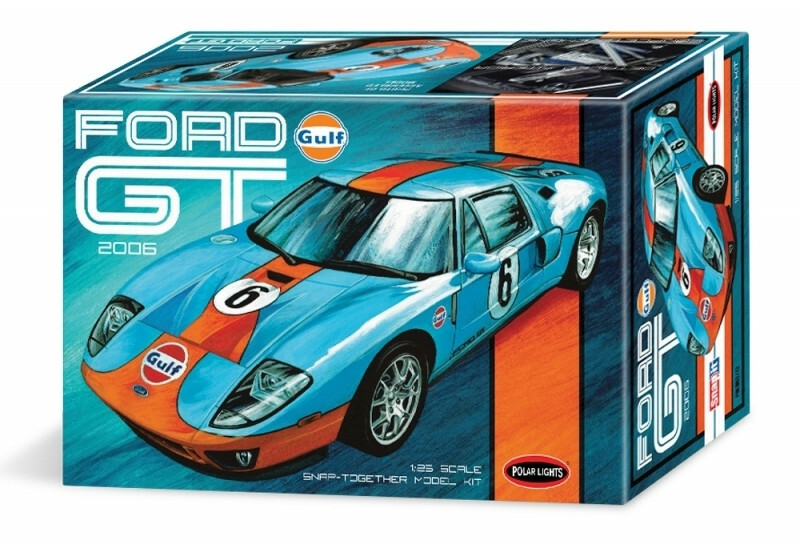 This kit from Polar Lights includes Gulf Oil decals to decorate the car as if the race were held today! The kit features snap assembly, but includes detail and parts expected in most glue-together kits including detailed suspension, chassis, interior and engine.